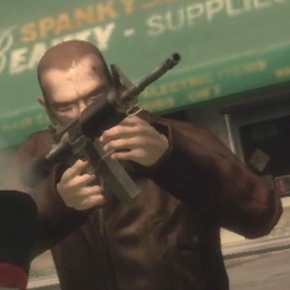 Difference between revisions of "M16"
*'''GTA Chinatown Wars (2009)''': Referred to as the "Carbine Rifle" in-game, it is difficult to identify this gun, however it has a full stock and long barrel, suggesting an M16 (model unclear, possibly A2). It has tremendous power, more akin to that of a machine gun, and it has a 50 round magazine like its GTA San Andreas incarnation. *'''GTA V (2013)''': An AR-15 carbine modified with a Magpul CTR stock and a Daniel Defense MFR handguard. Similar to GTA IV's M4A1, it lacks the carrying handle, making use of a rear drum sight. Throughout the GTA V trailers, it has been seen with a sound suppressor, Magpul AFG2 angled foregrip, and differing paint jobs. *'''GTA V (2013)''': An AR-15 carbine modified with a Magpul CTR stock and a Daniel Defense MFR handguard. Similar to GTA IV's M4A1, it lacks the carrying handle, making use of a rear drum sight. Weapon mods include and extended clip, increasing its ammunition capacity to 60 rounds, a grip that gives an added stability and a slight increase for accuracy, a flashlight, a scope, a suppressor that silences the weapon but slightly reduces the weapon's damage and range, and color tints (in Black, Army, and LSPD). Grand Theft Auto: San Andreas, and Liberty City Stories share the same 733. 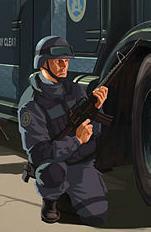 In Grand Theft Auto: Vice City Stories an M16A1 is used instead, recognized with the full plain stock and longer barrel. 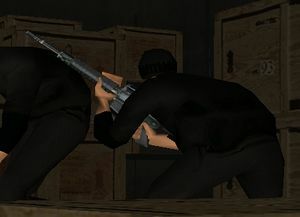 GTA III (2001): Resembling the similar Armalite AR10, it is referred to as an M16. This version is a highly inaccurate and exaggerated weapon, with a 60-round magazine and an exceptionally high rate of fire. It is also missing the delta ring and is very boxy due to its low poly-count. GTA V (2013): An AR-15 carbine modified with a Magpul CTR stock and a Daniel Defense MFR handguard. Similar to GTA IV's M4A1, it lacks the carrying handle, making use of a rear drum sight. Weapon mods include and extended clip, increasing its ammunition capacity to 60 rounds, a grip that gives an added stability and a slight increase for accuracy, a flashlight, a scope, a suppressor that silences the weapon but slightly reduces the weapon's damage and range, and color tints (in Black, Army, and LSPD). GTA Vice City, GTA San Andreas, and GTA Libety City Stories. A similar AR-15 carbine to the one seen in GTA V, minus the rear sight. Prawn Island - In Studio B (behind the moon lander) at the InterGlobal Films complex. Starfish Island - In the small room at the bottom of the Mansion's stairwell east of the main entrance after the completion of "Rub Out." Downtown - Available to buy from Ammu-Nation for $5,000 after completion of "Rub Out." Los Santos International Airport, Los Santos - Next to the runway, there are three white and yellow striped "ramps". Between those which are placed at the end of the runway. Area 69, Bone County - Behind a staircase leading to a control tower. Bedford Point, Staunton Island - Available to purchase from Phil Cassidy's Fully Cocked Gun Shop for $5,400 once the player beats the mission "Friggin' the Riggin'".